Your shortcut to understanding all the money lingo. With 50+ words you need to know. First, you have to know what you owe. Then, you can make a game plan. Follow this self-assessment series and learn more about yourself. “Whatever your situation, I'm glad you're here. Where you are with your money, right now, matters. The goals you set matter. The fact that you’re always growing and becoming matters. What you choose to do with your money — starting now — will affect Future You. 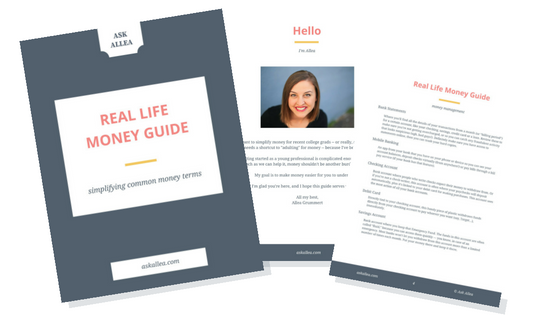 The goal of Ask Allea is to bring money questions to the surface, answered with hard truth, actionable steps and a dose of sass. Don't see the answer? Ask me! Thank you! You'll hear an answer from Allea soon. A cheat sheet to understanding all the money lingo.